Not only does this Rooibos tea from the South African Cedarberg Mountains have a delicious, sweet, nutty flavor, it has antioxidant properties that surpass any other known antioxidant as well. The Khoisan tribe has long known about this caffeine free elixir, and it's just now gaining popularity around the globe. Physicians have discovered that Rooibos contains 9 types of flavonoids. Four of the 9 are especially powerful, namely quercetin, luteolin, isoquercitrin and rutin. Working in conjunction with the tea's considerable antioxidant content, these flavonoids act as agents which reportedly actively fight the harmful free radicals in the human body. Left unchecked, free radicals will attack your fat, protein and DNA cells, the building blocks of the body. 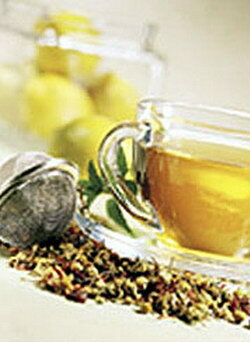 Flavonoids like the quercetin found in Rooibos, help to neutralize the invaders. Hereby reducing cell-damage, and leaving your body's immune system more resilient.